This dress is a custom made one of a kind couture design. The designer won the ABIA award for best designer couture gown for this beautiful dress. This dress was featured in the herald sun. The bodice consists of French Lace and more than 2000 hand-sewn Swarovski crystals and beads to give it an extra element of beauty. The top is a beautiful lined with a natural white colour with visible buttons all down the back of the dress. The French Lace is all around the neckline of the dress the bust and back that has been used to give a very delicate scalloping. 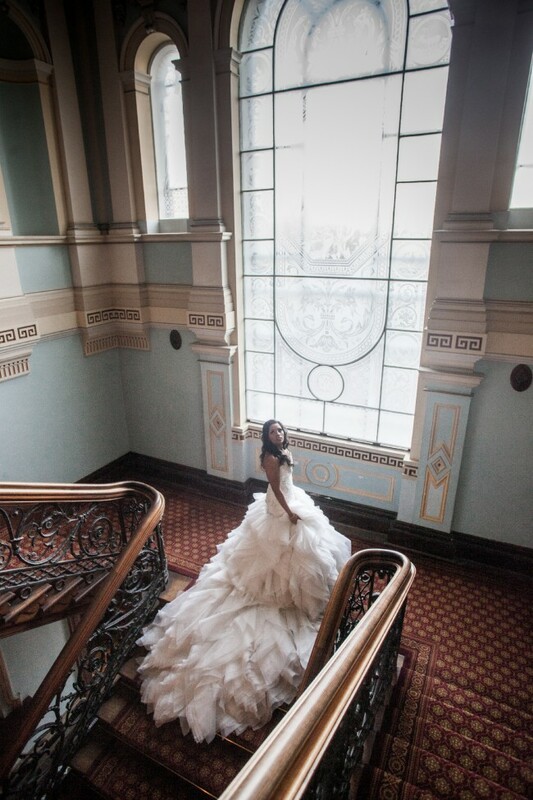 The skirt and train of the dress is layered with over 100 meters of pure silk organza, and tulle. The train bustles up beautifully at the back as per the photo. A hoop was worn on the day but is not included. It is structured with hidden boning and zipper and fits the body like a glove. Every single person who saw this dress and see the photos have said it is the most amazing dress they have ever seen. You won’t be disappointed!! It was worn once in March. The dress has not been dry cleaned however price negotiable to cover this. I am a street size 10 usually however dress can be altered if required.